Maybe grandparents are being recognized at the baby shower, or perhaps there is a Grandma Shower or Grandma Sprinkle hosted by friends. There is always room for a gift of sentiment on these emotional life-changing occasions. 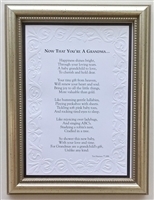 Choose a gift from the heart from our collection of new grandparent gifts.